The archaeological site of Tierradentro is an impressive and mysterious artwork, from an unknown but refined civilization. Located in the esplanades of Segovia, El Duende, El Tablòn, Alto de San Andres and El Aguacate, the hipogeos of Tierradentro are oval burial chambers, with a deepness that reaches nine meters. A winding staircase, built using volcanic stones, leads to the entrance, while two columns support the circular vault inside of each tomb. The walls are richly decorated with geometric and anthropomorphic figures, using red and black (life and death respectively), on white background. 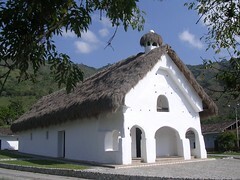 Nearly nothing was found in the chambers when they were discovered, because of the thieves activity (guaqueros), but what remains gives a clear idea of how incredible were these architecture artworks, able to resist the tremendous earthquakes that periodically hit the region of Tierradentro. A friend, beyond that many beautiful photos, left trace of our nights in San Andres Pisimbalà, follow this link: www.flickr.com/photos/mariusencolombia. In a day of movements with buses and camionetas we cover the whole Cauca valley, from Armenia (eje cafetero) to Popayan, passing through the lively city of Cali. 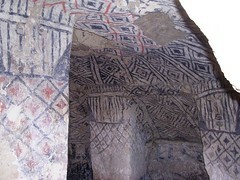 Our goal is the region of Tierradentro, an archaeological site, almost unknown by tourists for problems of security, but particularly interesting for the presence of underground burial chambers, unique example of Pre-Columbian art (V-VII sec D.c.). The village of San Andres Pisimbalà is a charming place, inhabited by extremely nice people, belonging to the Paèz indigenous community. It remembers to us Chiapas and Guatemala, where we lived unforgettable experiences. To reach this pueblo an entire day of travel on unpaved roads is needed, but just for this reason the region conserves its authentic beauty. Here, the nature is wild and strong, leaving no satisfactions to the campesinos, nevertheless you can breathe an incredible peacefulness. We stay at Doña Marta’s casa familiar: she’s a nice old woman who loves cooking us the best arepas of Colombia.